What caused the landslides in Uttaranchal? On the night of September 24, residents of Uttarkashi in the Garhwal Himalayas were jolted by rumblings of rocks and boulders hurtling down the Varunavat parvat (hillock). Landslides have ravaged this ancient pilgrimage town ever since. Many buildings including high-rise hotels and houses have come under a steady stream of mud, boulders and broken rock pieces that slide down from Varunavat parvat , a mighty hillock overlooking the town of 20,000 people. Fortunately, no human casualty has been reported, though the material loss has been significant. The Uttarkashi district administration reacted by clamping a red alert in the area and evacuating about 3,000 people living along a one-kilometre stretch on the Uttarkashi-Gangotri road, that separates the hillock from the township. Why did it happen? Geologists are clueless about the exactcause of the event. So are residents of the town. According to Suman Rawat, a social worker and physics professor in the local government college, heavy rains in the intervening night of September 23-24, "Seems to have set off the landslide." The site of the calamity has since been surveyed by a multi-institutional scientific team drawn up from the Dehra Dun-based Wadia Institute of Himalayan Geology, Geological Survey of India ( gsi) and the Roorkee-based Central Building Research Institute ( cbri) . Their preliminary report, submitted to both the district administration and the Uttaranchal government, notes that a lot of debris is still accumulated on the top of the hill. A rough estimate by the scientists indicates that debris amounting to about 40-50,000 cubic metres is still to come down. And until the debris throw is over, a detailed study is difficult, the report said. According to eyewitnesses, the land-movement, that began on September 24, is still continuing, making it a peculiar geological event. Shantanu Sarkar, the cbri scientist who led the team, says the dislocated debris that is yet to come down is stuck on a gentle slope on the hillside. Whenever the sun is up, the moisture that holds the fractured rocks together evaporates, releasing rock pieces. And this, according to Sarkar, explains the steady stream of rocks and mud sliding down into Uttarkashi town during daytime. Fallen trees occasionally hasten the fall. Many other geologists also categorise the current landslides in Uttarkashi as a debris flow. Such a landslide is characterised by an extremely rapid flow of a mixture of rock fragments, boulders, cobbles and gravel. This mass is set in a matrix of sand, silt and a little clay, with variable quantity of water. The debris is released as a result of weathering of rocks and the processes of deforestation. It then moves down the slope -- usually in surges -- because of gravity. Debris flows along hill slopes frequently follow a channelled path. A typical debris flow has three distinguishable segments: the source area, the main flow track and the depositional toe. The source area is normally an active landslide zone with a scar and ruptured surface. The source of the flow is often located in first order watersheds, with steep topographic slopes. In such areas, loose soil is very likely to accumulate and that serves as the source for the debris. The flow track may follow a pre-existing drainage channel. It can have a typical V-shaped cross-section and be fairly long, leading to long-distance transportation of debris. The debris flow ends in an alluvial fan or cone, as it enters into a wider valley with a lower gradient. Uttarkashi town is surrounded by a number of hillocks, which geologists say are made of paleo-glacial waste materials left behind by melting glaciers several hundred thousand years ago. These loose rock materials are highly weathered and fractured and are capable of shifting location at the slightest instance. Also flowing along the town is the Bhagirathi, a main tributary of the river Ganga. Till the 1960s, Uttarkashi was more like a small hamlet that serviced pilgrims trekking to Gangotri. But, the decision to make this town the district headquarters, in the mid-1960s, led to a large number of people from neighbouring villages settling here. Says Hansvanti Bisht, a reader at the Women's Post-Graduate College, Uttarkashi, "In the early days human settlement here was restricted to a narrow strip of land between the Varunavat mountain and the Bhagirathi river, called Bara haat by the local population ." "The people then were wise enough to use the land on the either side only for farming. That helped them escape from natural calamities, such as landslides and flash floods. But, these unwritten norms were thrown to the winds as population pressure mounted and many farmlands were slowly converted into settlements, despite their geological instability," says Bisht. She says no lessons were learned even after the 1991 earthquake that killed 650 people and destroyed property worth crores in Uttarkashi town and neighbouring villages. "Since then, many hotels and houses have come up in the foothills of the Varunavat mountain, which were otherwise avoided for settlement." Sarkar admits that the earthquake had made the region quite unstable. Major landslides happened at Thambakhani last year and and this year, Gyansu nala, which is very close to Uttarkashi, was hit by the calamity a month before this land rupture. In fact, landslides have become a recurring feature during the rainy seasons in Uttarkashi after the 1991 earthquake. In the last five or six years, they have been particularly prolific along 400-metre-long Thambakhani track, which empties boulders and rock fragments onto the Uttarkashi-Gangotri main road along the river Bhagirathi. To prevent debris falling onto the main road, the civic authorities of Uttarakshi have constructed a breast wall. This reduced the damage caused by landslides in Uttarkashi town quite substantially, say local residents. This year too the debris -- mainly consisting of rock fragments of varying size -- took the Thambakhani track. But subsequently, two new channels opened up, much closer to residential areas: near Uttarkashi bus stand and Masjid Mohalla. Also, a more important difference this time is that instead of the debris flow coming down in surges, there has been continuous movement of rock pieces. Geologists working with the Narendra Nagar-based nongovernmental Academy for Mountain Environics ( ame ) say in the aftermath of the 1991 earthquake, cracks had formed on the top of the hillock. These cracks even find a mention in some district administration reports immediately after the earthquake. But, detailed studies have never been conducted on these fissures. Every year, rainwater seeps into the Varunavat hillock through these fractures, says Ramkrishna Mukherji, a consultant with ame . He ascribes the 24 September slides to the already fractured rock formations giving away due to intense pressure of water. Another section of geologists hypothesise that the 1991 tremors could not release all stress energy that had accumulated in the region over the years. They say that the 1991 quake measured 6.1 on the Richter scale, when tremors of even greater intensity were feared -- of 8 or more on the Richter scale. This is because the Main Central Thrust, a seismic fault line that demarcates the Central Himalayas from the Lesser Himalayas, passes through Maneri, about 12 kilometres away from Uttarkashi. Sarkar, however, rules this out. Scientists discount the possibility of fallen debris blocking the river Bhagirathi and creating a potential flood threat in the region. 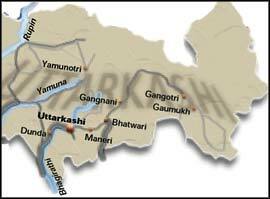 "It is impossible as the river is so wide in and around Uttarkashi," says Sarkar. Mukherji also agrees with this reasoning. "The river is reasonably away from the foothills and it is quite unlikely that the debris will reach the river," he says. But, there are more ominous portents. Mukherji, who has studied Uttarkashi extensively, fears many landslides similar to the one in September 24 in the area over the next few years. The Varunavat hill is made of highly-fractured and weathered rocks such as phyllite and quartzite. These rocks, left behind during the deglaciation of the region thousands of years ago, have made the hill highly fragile. The ame scientist also says the rains, that the region receives in November-December months could could increase water seepage into the rock formations, leading to more landslides. "It looks like a slow but painful death for Uttarkashi town," he says. Meanwhile, unconfirmed reports say that authorities are toying with the idea of shifting major government offices and institutions to Joshiana, a village on the other bank of the Bhagirathi. While the landslides offered a unique spectacle to many who seemed more curious than concerned, many are directly impacted - particularly those who have been evacuated from the hazard zone. 3000 refugees, their houses fully or partially damaged, have no option but to accept temporary accommodation offered in the 10 relief camps run by the district authorities. These camps do not fall in the itinerary of Central and state ministers or other dignitaries who drive down to the town to 'assess the situation.' "We are unsure of our future," says 38-year-old Lalita whose family of seven shares a rundown school shed with another family. They spend all their days either looking at the boulders ravaging their dream houses one after the other or waiting in long-winding ques for the daily ration of roti and cooked dal . According to an article by R P Gupta and A K Saha of Department of Earth Sciences of the Roorkee University in the GIS Development journal, "planetologists today compare the earth system to a living body." These scientits hold that "Debris flow channels are nature's agents that transport waste (debris) to disposal sites. Therefore, it is necessary that debris flow tracks are not truncated or interfered with. This is particularly so because the natural debris discharge in relatively thin channels takes place in a more environment-friendly manner, as can be seen from the lush vegetation thriving on both sides of the debris flow tracks." "This seems to be nature's way of politely saying 'get out of the way'. We should pay heed to this warning. It is high time that environment-friendly town planning is adopted not just for Uttarkashi, but for all Himalayan hill towns," says R Sreedhar of ame. Most of the 72 hill towns have gone much beyond their carrying-coping capacity and are on the brink of disaster. The damage caused by the Uttarkashi landslides has been severe. But will the authorities learn and stay away from haphazard developmental activities in fragile ecological zones?